iPed(tm) for the Mac is Here! Introducing full-powered Pedigree Management for Apple OSX. For decades, Apple's Mac family of computers has set the standard for ease-of-use. Everyone loves to use the Mac. 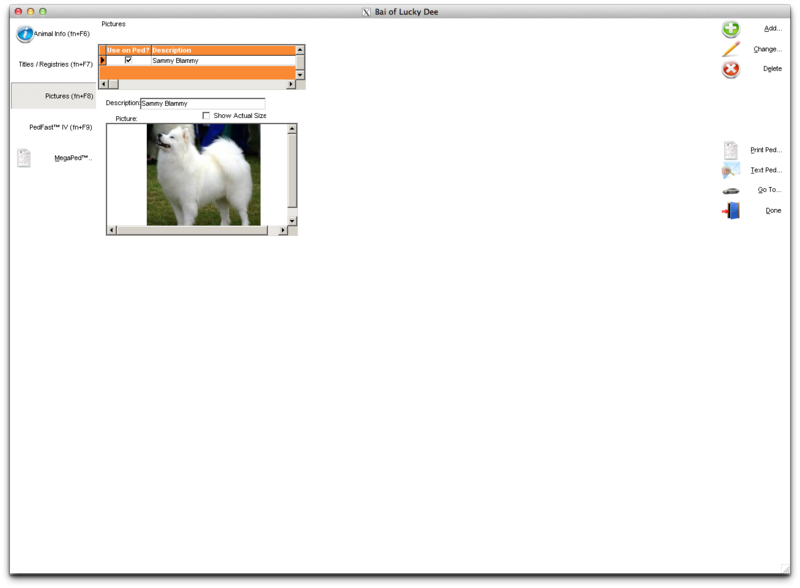 However, pedigree management software would only run inside of an emulator such as Parallels or VMWare Fusion. Slowly and inconveniently. No more! iPed™ 4G for the Mac is here. It runs in OSX. No Parallels or VMWare. The legendary PedFast Technologies ease of use. Easily installed. Download and run. iPed™ 4G for the Mac works the way that you think. You have lists of your animals and your contacts. You can manage both with ease. Does a friend have a PedFast program on the PC from which he or she would like to share animal data? Our BXF™ import/export technology is built-in. Sharing data is completely easy. Do you want to email a pedigree to a friend? We have a speedy text pedigree that can be emailed in a matter of seconds. 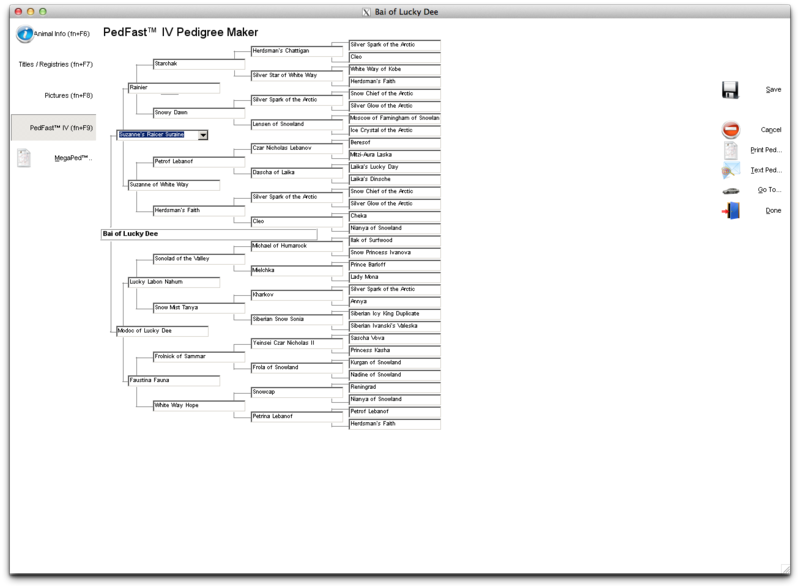 iPed™ 4G for the Mac supports easy pedigree entry with our famous PedFast™ IV Pedigree Entry engine Enter up to 63 ancestors -- up to a complete five-generation pedigree -- from just one window. PedFast™ IV handles connecting the ancestors and entering the proper information into its database. iPed™ 4G for the Mac supports an unlimited number of titles, breeds, and registries. It holds up to 2.1 billion animals! And all of it is designed to be easy to use and easy to keep. 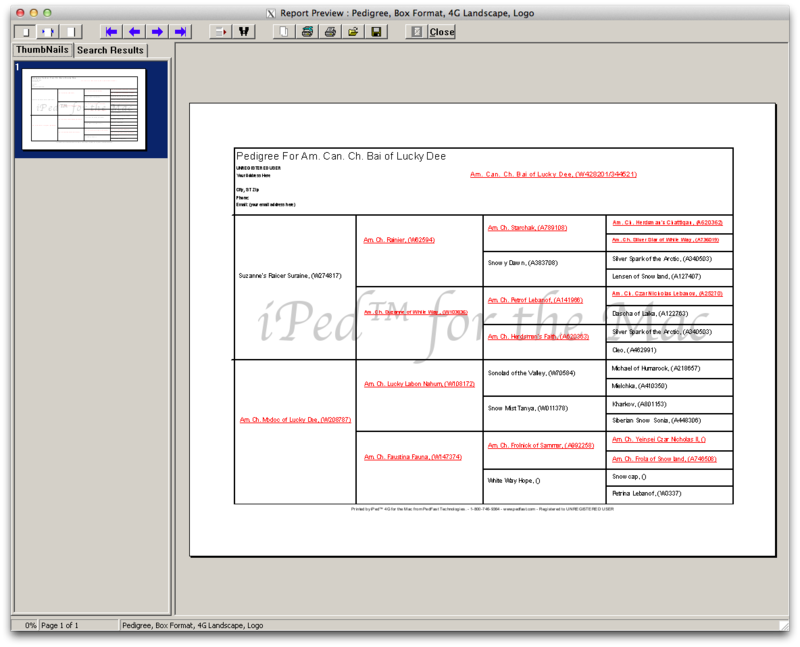 iPed™ 4G for the Mac stores important text information, including titles, ownership, breeders, and genetic information. Easily kept and organized and easily read. 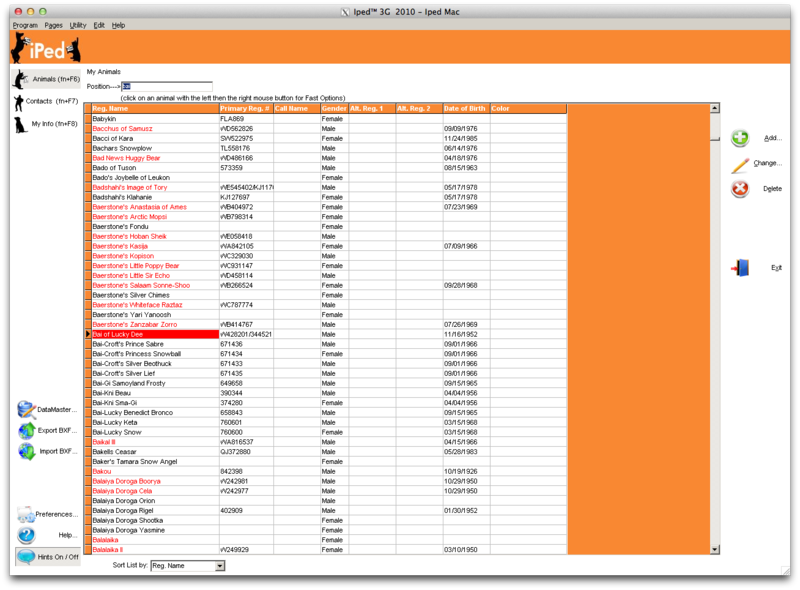 Even more important, you can store up to 65,536 pictures of each animal in your database. You can choose which one to use in our beautiful pedigrees (see more about this below. Our program accepts all popular pixel graphical formats. Again, everything is made easy for you. We did the hard work to make your work easier. 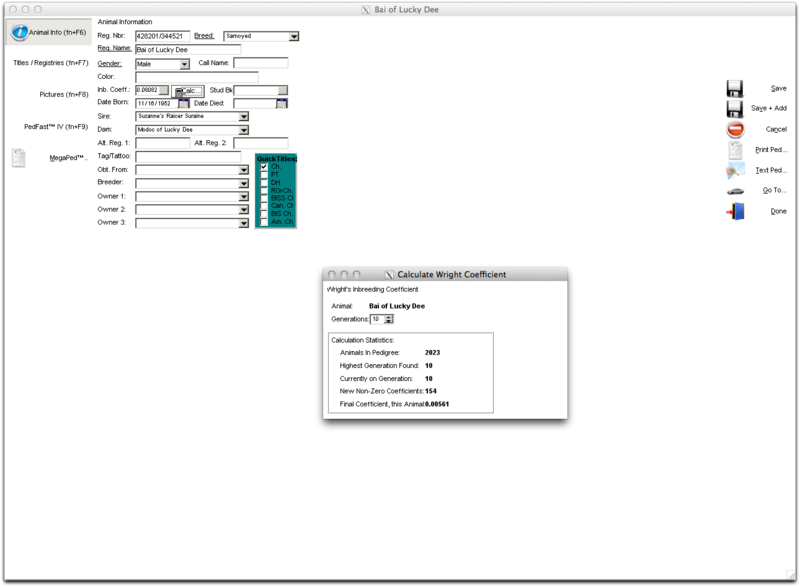 iPed™ 4G for the Mac is the only animal pedigree program for the Mac that accurately calculates Wright's Inbreeding coefficient. Our program calculates the coefficient to 10 generations, and allows inbred ancestor recalculation in a single pass. The calculated value is stored on the animal record and can be expressed as the classical "F" coefficient or as a percentage on our pedigrees. iPed™ 4G for the Mac produces the most beautiful pedigrees, in full keeping with our reputation as the company with the best pedigrees, bar none. iPed™ 4G for the Mac includes our famous MegaPed™ 4G pedigree generation engine, giving you control over font faces and colors, and allowing you to choose what information from each animal prints into the pedigree. To decorate your pedigree, you have the choice of a kennel logo, animal photo (certain layouts allow multiple generations of animal photos), a text of graphical watermark, borders, different coloration and fonts for animals with titles and much more. And then, you can see your pedigree! To the left we have a preview of a pedigree using one of the most basic formats. But even this format supports a kennel logo, animal picture and full font control. The Watermark can be adjusted to whatever font or text you want, or even a graphic that you can fade down as desired to keep it from overtaking the text. 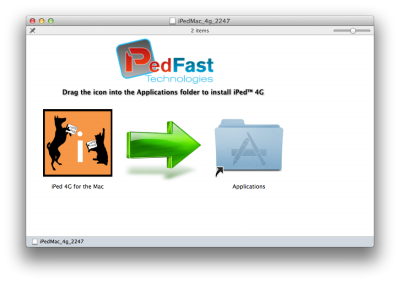 On or before March 15, 2013 we will release a special edition of iPed™ 4G for the Mac with all of our pedigree power packs built in. This will give you over 175 formats of pedigrees, announcements, show ads, pedigrees with up to seven generations of animals and other features. Drag the icon into the folder. Everything else is handled for you! iPed™ 4G for the Mac is available for immediate download and purchase. Download here right now and try the program for up to 14 days before purchasing! iPed™ for the Mac is not compatible with PowerPC-based Apple products. We recommend running it on a Mac with OSX Lion or Mountain Lion. You need about 350MB of disk to install iPed™ for the Mac. You will need more space to add animals and data. Certain users of older editions of Leopard may need to download another program. 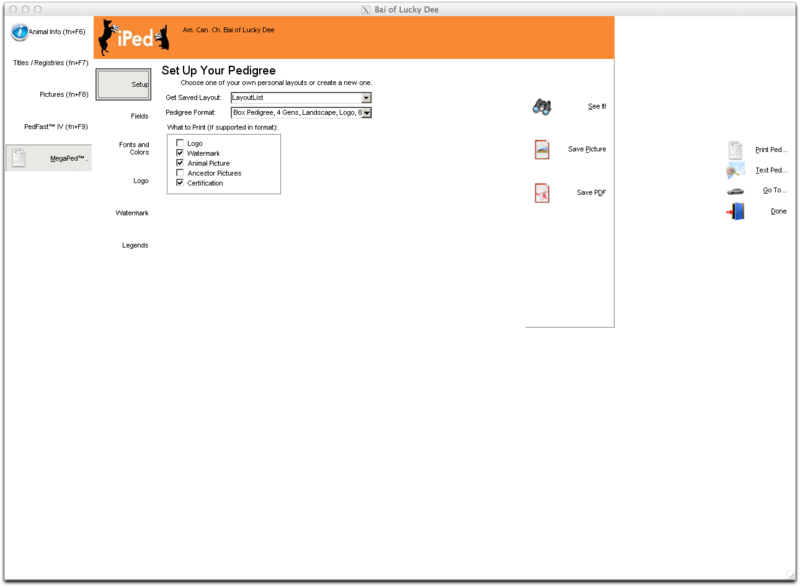 See the download instructions when you download iPed™ for the Mac. Get all of the Power Pack Formats! Others Promise. At PedFast Technologies™ - We Have Delivered.